Digital disruption is turning finance on its head -- and destroying tons of traditional banking jobs along the way. A wave of innovation has made it possible for people to get their banking done without walking into a branch if they don't want to. People can now deposit checks using a smartphone or digitally fire off cash to friends using Venmo. The end result is a pretty sweet experience for consumers...but an imminent threat to people who work at bank branches. Former Barclays (BCS) CEO Antony Jenkins has likened this to the banking industry's Uber moment. Indeed the smartphone revolution has shifted the e-commerce landscape to a point that threatens more established players. The payments business has experienced some of the greatest changes, with platforms like PayPal, Apple (AAPL) Pay and Square (SQ) transforming the way consumers make payments. And then there's sophisticated robo advisers like Wealthfront that can manage money automatically. Even highly paid Wall Street jobs aren't safe. New platforms like Kensho are using technology to spew up sophisticated research reports in minutes that highly paid Wall Street analysts would normally take hours to prepare. There's enormous sums of money being poured into such emerging financial technology. 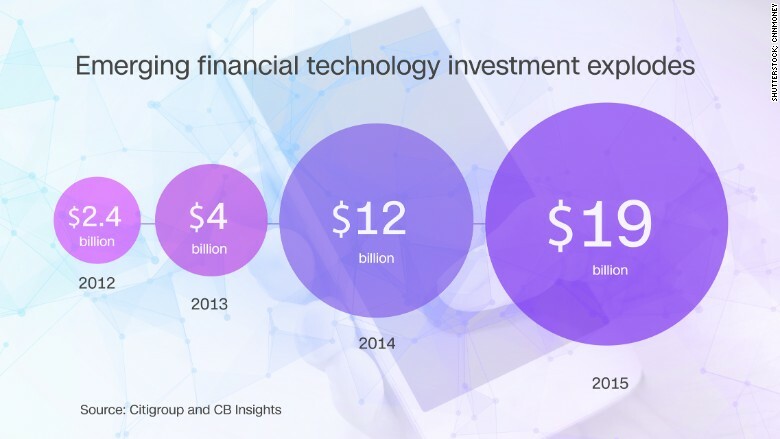 Investments in fintech has exploded to $19 billion last year from $1.8 billion in 2010, according to Citi and CB Insights. More than 70% of this investment is focused on making the customer experience better. "Silicon Valley is coming," JPMorgan Chase CEO Jamie Dimon said in his 2015 annual letter. "There are hundreds of startups with a lot of brains and money working on various alternatives to traditional banking." So far, traditional banks have withstood this assault pretty well. Just 1% of North American consumer banking revenue has migrated to new digital models. That's because the big banks like JPMorgan (JPM) and Wells Fargo (WFC) have the advantage of scale. But Citi thinks that will change soon, especially given the sluggish business environment for traditional banks and the transformative power of new technology. This shift has already taken place in China, where Internet giants have supplanted top banks in some cases. "We are not even at 'the end of the beginning' of the consumer disruption cycle" in the U.S, said Greg Baxter, Citi's global head of digital strategy. By 2023, roughly 17% of North American consumer banking revenue could be impacted by digital disruption, Citi estimates. How will banks respond? In part by cutting costs -- something most big banks have already done lots of since the 2008 financial crisis. Branches and associated staff costs make up about 65% of the total retail cost base of a larger bank, Citi said. 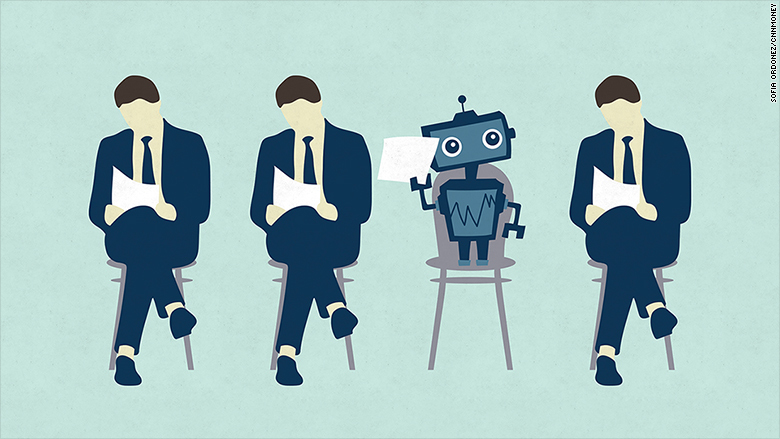 Much of these jobs are at risk from automation. Branch teller jobs are particularly threatened. The number of U.S. branch tellers has declined by 15% since peaking in 2007 and Citi says these losses will accelerate because some two-thirds of bank employees are doing processing work that could eventually be automated. 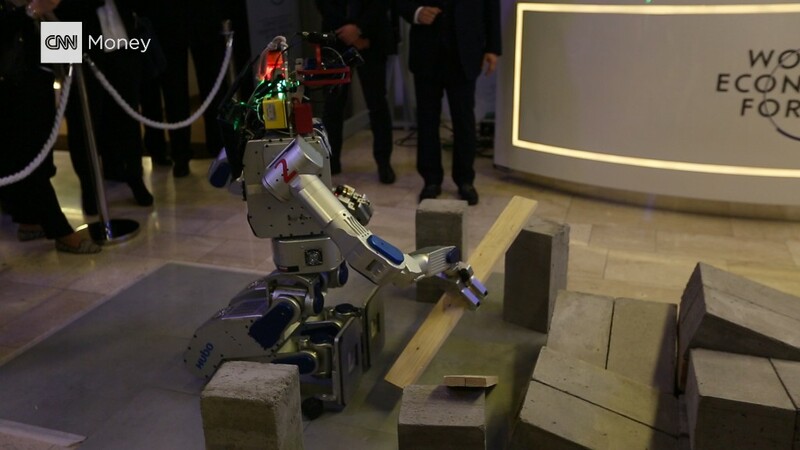 Even more exciting innovation could further disrupt banking jobs in the future. For instance, banks are experimenting with blockchain, the technology that Bitcoin uses to verify transactions all over the world. Think of it like a perfect record log. Many believe that banks will eventually perfect blockchain and use it to power recordkeeping and cross-border payments. It's another reason why futurist Amy Webb has for years been predicting the loss of many bank jobs to automation. "As computers become smarter, we no longer need humans as intermediaries," said Webb, founder of Future Today Institute. "Professions whose basis is in transactions will be disrupted by machines -- there is no question. And it will happen fast," she said.